Dr. Alex attended The Aesthetic Show at the Wynn hotel in Las Vegas, NV July 10 - 13, 2014. This was the fourth year in a row Dr. Alex attended this conference, and it has grown each year. It brings together doctors, nurses, and ancillary staff from multiple subspecialties such as dermatology, plastic surgery, gynecology, and more to share what's new in cosmetic medicine. Dr. Alex attended lectures on topics such as lasers, facial rejuvenation, injectables, and marketing. The exhibit hall was full of booths, and exhibitors included laser companies such as Sciton lasers, injectables such as Allergan (makers of Botox, Juvederm, and Voluma), skin care products such as Elta MD, and much more. The highlight of the weekend was The Aesthetic Awards ceremony on Saturday night, which showcased the best of the best. 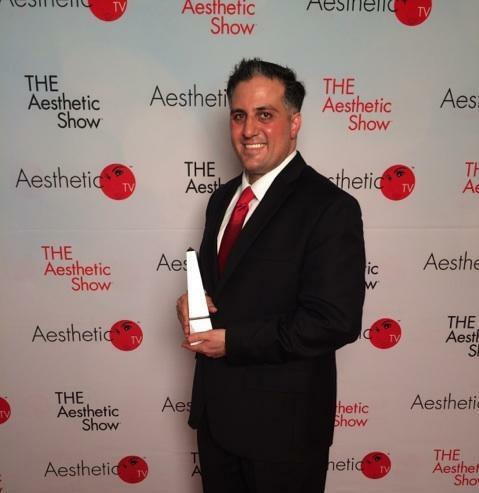 A E Skin was honored by receiving the Aesthetic Practice of the Year award, a unique award that is determined by voted from patients.